Your honeymoon is the icing on your wedding planning cake! Dig in! You have spent months (and maybe even years) planning for your big day. Be sure to pamper yourself for all of your money saving attempts and planning efforts. Kick back, relax, and let reality set in – you are now someone’s spouse! Choosing the best honeymoon destination to celebrate your new union is easy and can be totally affordable. Read on to learn about three things you can do to ensure you pick the best spot to celebrate your honeymoon. Hurricane season can really put a halt on your honeymoon plans. If there is a tropical island you have always wanted to visit, you may have to plan your vacation around its climate. Generally, hurricane season starts June 1st and ends around November 30th in the Caribbean. Despite popular belief, no island is “safe” in this area at that time and on average, 10-12 hurricanes hit each year. If you need to take your honeymoon immediately after your wedding in summer and early fall months, consider visiting Mexico or Southern California where you will be free from ultra-rainy weather. If you want to take a chance in the tropics, be sure to purchase traveler’s insurance so you can get fully refunded and visit the islands another time. Do you love to lounge on the beach with a cold drink in hand? Or, are you more of an adventure junkie or sight-seeing fanatic? It’s essential to know your vacation personality (as a couple) before booking your honeymoon. If the beach is all you desire, hit up Turks and Caicos; which are known for their beautiful and desolate beaches and unforgettable sunsets. If you are a history buff and love to be on the go, Europe will satisfy your sightseeing urges. If you love to get down and dirty, consider visiting Costa Rica and zip line and kayak your day away! If you are on a tight budget, you can still go away on a honeymoon. Simply, take a chance! Sign up with top travel sights and get on their email list so you can view their last minute deals and steals. You can book a last minute trip days after your wedding and save a fortune! Plus, it’s exciting not to know where you’ll end up and will make for a great story to tell for years to come. Consider these three important tips when thinking about planning your post-wedding trip to ensure you pick the best vacation spot for your personality and budget! When it comes to planning your wedding ceremony, you may be focused on the big show-stopping details, like the style of your wedding dress and the colors of your bridesmaid dresses. But there’s another component of your wedding ceremony that can play a big role in impressing your wedding guests: your limousine options. Traveling to and from your wedding ceremony should be just as special as that walk you take down the aisle. After all, this is the moment where you’ll be able to bond with your father before you become a Mrs., or when you can excitedly squeal with your bridesmaids as you see the church up ahead. Therefore, you want to ensure that your limousine plays just as special a role in your wedding day as your cake, dress, and DJ! Word of mouth is one of the best ways to discover a limousine driver that will give you the high-quality transport experience you deserve. If you have any friends that were recently married, consider asking them who they used as a driver, and if they’d recommend the company. On a similar note, you may want to go online and check out customer reviews for local companies. Have the customers posted relatively positive reviews for the limousine service? Is the company usually on time? Do they go above and beyond to make their customers happy? If you can find a company that meets all these requirements, then you’re well on your way towards finding a high-quality limousine service. 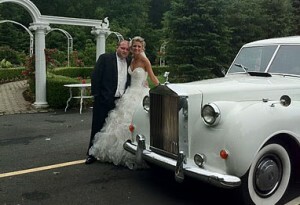 Of course, you’ll want to make note of which limousine style you want to sport on your wedding day. Classic black stretch limousines can make a stylish impact on your wedding ceremony, while stretch white limousines offer a fun throwback to vintage styles. Classic cars such as a Rolls Royce or Excalibur are all beautiful options that allow you to arrive in style. Finally, you’ll want to ensure that your limousine options fit your wedding budget. You don’t want to start your wedded life in debt just because you ended up splashing out on your wedding transportation! Use these tips and techniques to find the best limousine option so you can focus on other things – like writing your vows or tasting that delicious wedding cake! Remember to ‘like’ us on Facebook to get up to FREE return address printing! Hurry, this deal ends October 31, 2012, so don’t miss out on this amazing offer!